About 6 years ago I came to the painful realisation that I probably was never going to soundtrack one of those cool gothic Doctor Who episodes of the Philip Hinchcliffe era full of robot mummies, dilapidated country piles, mad scientists laboratories and Victorian sewers. The bird hadn't so much flown on that one as much as that the egg from which the bird would have to hatch in order to one day fly away had never been laid. So, I made my own. The process was simple. I came up with some characters led by a Thomas Carnacki, John Silence, Doctor Who type chap and a list of plot points that I thought gave a suitably vague story arc (so that I didn't have to do any actual story writing) and then composed around that list. I wanted this to be a fresh new start so I used an entirely new (to me) set of musical tools both to avoid slipping into any old habits or any of the same old compositional tricks I've used over the years and also in order to get a more appropriate sonic pallette and so armed I set about writing a suite of tunes that would evoke the music that had defined my ears. In line with the soundtrack idea I deliberately kept the music short and, in order to evoke an air of suitable menace and otherness, fairly atonal but on a couple of tracks I tried my hand at a tune or two which was a big step for someone who'd spent the last 12 years avoiding them like the plague. That first Phantasms EP came together over the course of a couple of weeks and the response was enthusiastic enough to plant the seed to make another one. By now I realised that this Phantasms thing was destined, in the great tradition of science fiction, to be a trilogy and so I duly embarked on the third part and hit a creative brick wall. To do the final entry in my holy trinity of Wyrd Britain sci-fi I'd have to have done 'Quatermass' next but that seemed to me to be a project in it's own right but I really wanted to round things off and say goodbye to these, partially formed, un-named travellers who have lived in my head for the last 6 years. And so, in the end, I did just that. I envisioned a story whereby the travellers are summoned to go on a journey to say a final goodbye to their comrade who has chosen to finally stop in this new place. He stays, they depart and all eventually find their way home. This one was undoubtedly the most difficult of the three to write and record. Half of the music came fairly quickly but then I kept getting distracted from it by work commitments and various other projects but once I'd established the narrative the final tunes were written and recorded in a few days. This third EP was finally released onto Bandcamp a few weeks ago, some 5 and a half years after the first one went live. So, over half a decade on from the initial whim to do something different and having enjoyed doing it so much that I've now adopted a new name under which to record this more, I suppose, radiophonic and hauntologically inclined music and I've decided to give the three EPs their time in the sun. Having previously only been available digitally via our Bandcamp page I've now collected the 3, given them a spiffy new name, some smart new black and white artwork and have made them available on disc for the first time. BTW - The three separate EPs are still online for those who may already have some of the parts and have no need to buy all three. 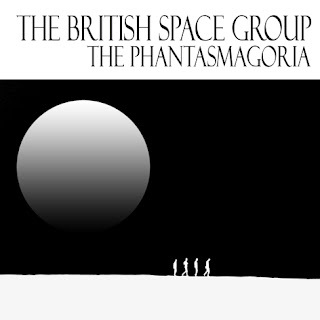 The Phantasmagoria is out now and available on both disc and digitally via the Quiet World Bandcamp page. hi Chris. thank you for your message and i'm glad you like the music. i have done collaborations in the past but not for a while as i've been mostly trying to re-find my musical mojo and do something different (for me). Since I turned off the lights on WWR i've been exploring and looking for that buzz that made music fun in the first place. that's kind of where i am at the moment; digging into places that i've never looked before - electronic and library music mostly - and revisiting old favourites like the radiophonic workshop.